Ángela Peralta (6 July 1845, Mexico City – 30 August 1883, Mazatlán) (baptised María de los Ángeles Manuela Tranquilina Cirila Efrena Peralta Castera) was an operatic soprano of international fame and a leading figure in the operatic life of 19th century Mexico. 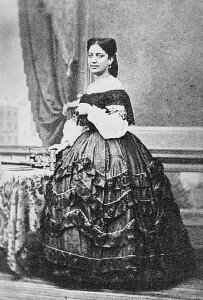 Called the “Mexican Nightingale” in Europe, she had already sung to acclaim in major European opera houses by the age of 20. Although primarily known for her singing, she was also a composer as well as an accomplished pianist and harpist. In the mid-1870s she began an affair with the Mexican lawyer and entrepreneur Julián Montiel y Duarte, which caused a scandal in Mexico City. The city’s social elite boycotted her performances and hired hecklers to harass her during performances. Her reputation recovered following her performance in Linda di Chamounix, but she kept her vow never to sing in Mexico City again. In 1883, with her reputation (and economic situation) again in decline, she began a tour of northern Mexico with her troupe of Italian opera singers. The tour began in Guaymas and proceeded to La Paz, Baja California Sur. It was in La Paz that she sang for the last time on stage – the title role in Maria di Rohan – with the performance taking place in a theatre improvised from a disused sand pit. On 22 August, the troupe arrived in the port city of Mazatlán, where they were to perform Il trovatore and Aida. The city of Mazatlán prepared an elaborate welcome for her. Her boat docked at a pier decorated with garlands of flowers, and she was greeted by a band playing the Mexican National Anthem. When her carriage arrived, her admirers unhitched the horses and pulled it themselves to the Hotel Iturbide, where she once again saluted the crowds from her balcony. However, within a few days, she and 76 of the troupe’s 80 members were to die in the yellow fever epidemic that swept the city shortly after their arrival. Ángela Peralta died in the Hotel Iturbide in Mazatlán at the age of 38 on 30 August 1883. She married her lover Julián Montiel y Duarte on her deathbed. According to an eyewitness account of the marriage ceremony, she was already unconscious when it took place. One of the singers from her company, Lemus, supported her by the shoulders. When asked if she took Montiel y Duarte as her husband, Lemus moved her head to make it appear that she was nodding her assent. Before her burial in Mazatlán, her body lay in state, dressed in one of her opera costumes and her best jewels. In 1937, her remains were disinterred and brought to the Rotunda de Hombres Ilustres (the Rotunda of Illustrious People) in Mexico City’s Panteón de Dolores. Both Mazatlán and San Miguel de Allende have theatres named in her honour. Peralta’s wide-ranging repertoire included: Leonora in Il trovatore, Violetta in La traviata; Elvira in I puritani; Marie in La fille du régiment; Amina in La sonnambula; Adina in L’elisir d’amore; and the title roles in Aida, Dinorah, Linda di Chamounix, Maria di Rohan, Lucia di Lammermoor, and Norma. She also created the leading female roles in three operas by Mexican composers: Ildegonda (1866) and Gino Corsini (1877) by Melesio Morales, and Guatimotzin (1871) by Aniceto Ortega del Villar.